It's hard to belief, when I look at Downtown today, how much it has changed over the years. Harvey Diederich told me "Downtown use to be much more important than it is today" and Carey Burke says "there were more changes there than anywhere else for a long time". Today the main reason to go downtown is for the Fremont Experience, the fried twinkies, big drinks and loose slots. But it wasn't alway like that. Downtown use to be the center of the universe in Las Vegas. The train depot, movie theaters, restaurants, shopping, cruising Fremont, gambling halls, lumber stores, homes, it was all centered around Downtown. When I was a kid, back to school meant mom was taking me to Ronzone's to get my feet x-rayed and buy new clothes. If Ronzone's was too expensive, there was Sears and JC Penneys. Coronet and Woolworth kept us supplied in school supplies. Lil Pardners kept us dressed in Helldorado finery. Wanted groceries, go downtown. Wanted a good meal, go downtown. The first Pizzeria was opened on Fremont Street shortly after WWII ended. The owners? Former Lt. Governor Lorraine Hunt's parents. The Beanery in the Depot, the Silver Cafe serving fine American and Chinese Food. Needed a prescription filled, we had White Cross Drugs (before they moved to Las Vegas Blvd South and Oakey), the Las Vegas Pharmacy and a Skaggs. Needed shoes?Gallenkamp and Florsheim Shoes were on Fremont Street. Need a suit or a good pair of pants? Alan and Hanson's Mens Wear. Diamond Ring? No problem, MJ Christensen's Jewelers. Ice Cream? The Sweet Shoppe. Hardware? Von Tobel's Lumber was the first and only stop for most folks. There were Indian Trading Posts, Smith and Chandler Western Wear, Ullom Photography Studios, a Pottery Shop and enough neon on the store fronts to keep your eyes entranced for days. And that's not even including the neon facades of the gambling halls. It truly was Glitter Gulch. A little history on Fremont Street and the places (many of which are no longer there) that made it the hub of commerce, socializing and tourism. #1 Main Street: Before the Union Plaza was built, this is where the Train Depot stood. In 1905, the Railroad offered a bargain to men and women who wanted to travel to Las Vegas for the land auction. If they bought land at the auction, they could get their train ticket reimbursed. Ed Von Tobel's father and Will Beckley took the train. By 1906, the little town of Las Vegas had a train depot. The original train depot was done in Spanish architecture and sat at the end of Fremont Street. It was surrounded by 63 acres of prime real estate that was owned by the Union Pacific Railroad. There were various metal and welding shops for repairing the engines and a Roundhouse. Gambling was outlawed in Las Vegas in 1909. However, this being Las Vegas, it wasn't that difficult to find a game of chance if you looked hard enough. In 1913, a new street lamp system was tested for the first time. The Las Vegas Age reported "The installation of the street lights will mark a long forward step in the life and business activity of the town and is the subject of much self-congratulation for our people". In 1919, a Fourth of July celebration includes a parade down Fremont Street welcoming home WWI servicemen, a street dance with a full orchestra and a baseball game with Ernie Cragen as the catcher. A brand new field was constructed on railroad property west of downtown. Ninety years later Mayor Goodman still believes in that concept. In 1925, Fremont Street is paved between Main Street and Fifth Street (now Las Vegas Blvd. South). "Beyond that", says George Foley, Sr "if you wanted to see pavement, you had to go to Barstow". In 1926, the highway connecting Los Angeles to Las Vegas was opened. Though officially called Highway 91, locals always referred to as the "road to Los Angeles". By 1931, the first street light was operating on Fremont Street. Over the years, as the little town grew up around Fremont Street, stately oak trees were planted and a circular drive was put in. During the construction of Hoover Dam, men slept on the lawn of the Depot waiting for the Dam Employment Office to open. The Beanery was one of the best places in town for a meal. The first long distance telephone call was received here. In 1940, the depot got a make-over and an Art Deco/Streamline Moderne building took its place. Wit the circular drive, it became a popular cruising spot for teenagers from Las Vegas High. 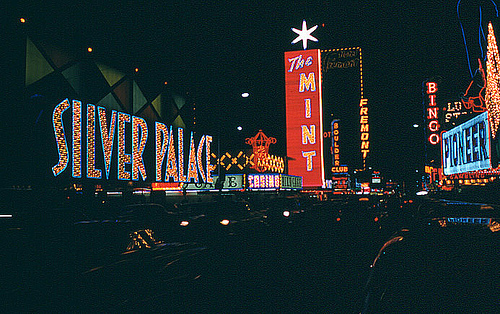 They would start down on East Fremont Street at the Blue Onion Drive-In, head west on Fremont and the trick was to go all the way to the end of Fremont, go around the circular drive at the Depot, and then back down Fremont without hitting a red light. This was called "Doin' the Donut". The City of Las Vegas train brought passengers from around the country to Las Vegas. But Las Vegas was growing. In the mid-1960s, Irwin Molasky built the Boulevard Mall and suddenly, we didn't need to go downtown to do our shopping. Over the years, the Indian Trading Posts, Western Wear stores and Pottery stores gave way to T-Shirt stores and souvenirs. As the town grew with small suburbs, we no longer had to go downtown to eat. Now, there were good restaurants in our own neighborhoods. People began to fly into McCarran International Airport or arrive via car from the new Interstate Highway. Train travel began to decline. In 1969, they tore the Train Depot down. There was only a small outcry from long time citizens. In its place, would be the Union Plaza Hotel. As part of this Hotel/Casino, it would have a small bus and train depot for those passengers. This was also be the main switching area for the local RTD buses. If you watch the movie "Diamonds are Forever" you can see the site under construction. The Union Plaza opened in 1971. It's original owners were: Sam Boyd, Jackie Gaughan, Kell Houssels, Jr and other businessmen. In 1986, Jackie Gaughan bought out his partners and it became Jackie Gaughan's Union Plaza. In 2003, Jackie Gaughan sold the Union Plaza to Barrick Gaming. Today it is just called The Plaza. Rumors continue to swirl that the Plaza has a date with the wrecking ball. The city owns the original 63 acres having bought that property from the Union Pacific Railroad. Rumors have it that Mayor Goodman wants the Plaza razed so that the whole area, including the 63 acres, can become mixed use residential and retail. The Union Pacific Railroad still goes through Las Vegas but it is as freight only. Amtrack stopped train service to Las Vegas about 10 years ago. Rumors persist that Amtrack is considering bringing back the Desert Wind for service between Los Angeles and Las Vegas. This being Las Vegas, stay tuned. 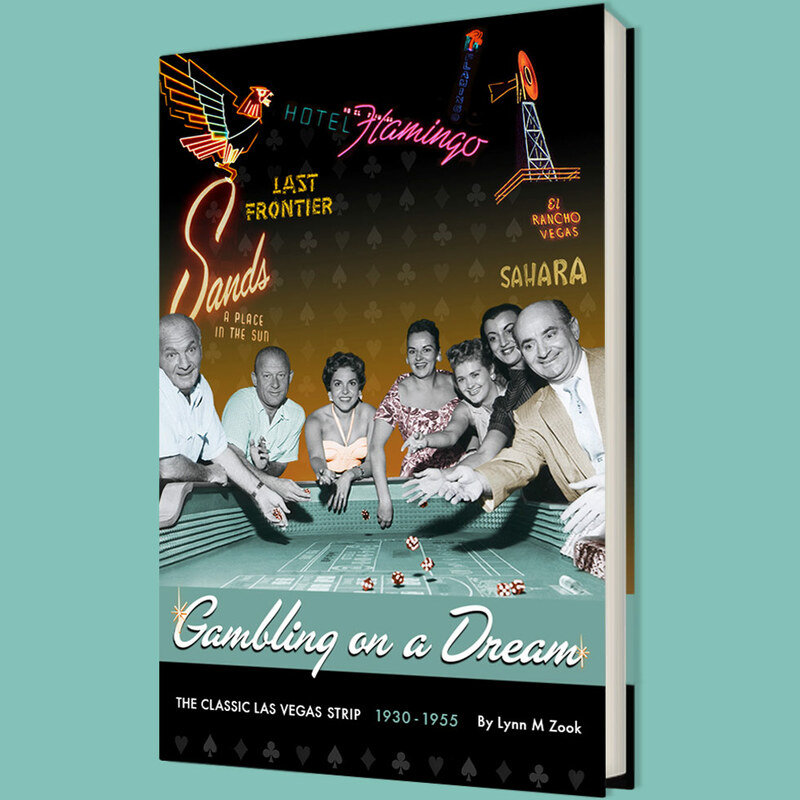 Special thanks to UNLV Special Collections, Nevada State Museum and Historical Society, Allen Sandquist and Carey Burke for permission in using all the photos. Word comes from our pals at CheapoVegas.com that Tamares has closed the Center Stage restuarant overlooking Fremont Street and turned it into a Sports Bar. This was where the swimming pool was originally located when the Union Plaza first opened. The swimming pool gave way to the Center Stage (which has a guest appearance in the opening credits of Michael Mann's mid-1980 television show, Crime Story) .